If you happened to be in my garden recently then you may have inadvertently found yourself in the middle of a skincare test. For the recent sunny spell coincided with lots of visitors, and me testing out bargain sun cream. I ended up passing round this Solait Sun Lotion to a pretty wide variety of people, with lots of different ages and skin types. And nobody who used it had any kind of irritation or got burned, so I think we can call that one a success. Whilst sun screen is an essential summer purchase, increasingly we are choosing to apply it all year round. The links between too much sun and both increased risk of skin cancer and premature ageing are undeniable. And it doesn’t have to be a mega sunny day for those things to happen. Once you’re out in the sun, sunscreen works for around two hours and will then need to be reapplied. So if you wear it on the way to work then stay indoors all day then you’re probably fine for the journey home, but if you’re outdoors more than that then you definitely need to reapply. 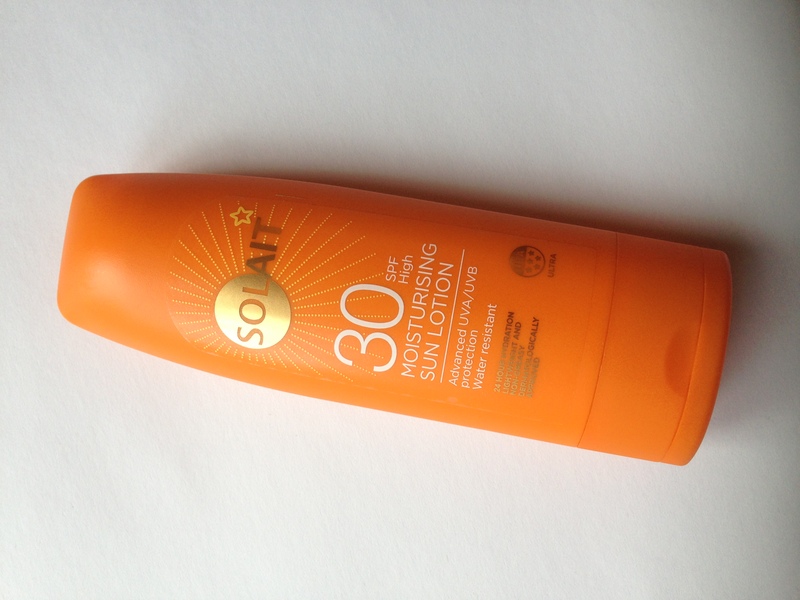 Solait is a range of moisturising sun lotion products available in Superdrug. In an independent test by Which? Magazine, it was one of a small group of sunscreens that passed the test for delivering the promised level of SPF and protecting against UVA rays. The survey also found that expensive sun creams are not necessarily any better than cheap ones. So bargain sun cream, and plenty of it, would seem to be the smart way to go. Two to three tablespoons of product (30 to 45 mls) for your whole body is the recommended dose and that’s a LOT. It’s worth actually measuring this out in tablespoons at some point so you can see exactly what you’re aiming for – chances are it’s much more than you currently apply. There’s no point in being stingy with sunscreen. And can I just say BACKS OF THE HANDS LADIES, BACKS OF THE HANDS. There’s a reason why your hands age faster than the rest of you, but you can avoid that with sunscreen. The active ingredients in sun creams deteriorate over time, so always check the expiry date. Whilst you can probably get away with using last year’s bottle, if you have sun screen that’s lasting for a year then you’re not using enough of it (or else you’re a vampire). This Solait lotion comes out of the bottle white and quickly settles into the skin without leaving a white cast. It’s water resistant but not waterproof – so it won’t stay on if you’re swimming, though it will tolerate a bit of sweat and splashes by the pool. It is quite perfumed with that characteristic sun cream smell, but also nicely moisturising. I personally wouldn’t use it on my face if I was wearing make-up; I’d rather use a dedicated facial sunscreen. But if I was on holiday and wearing little or no make up then I’d happily slap it on. 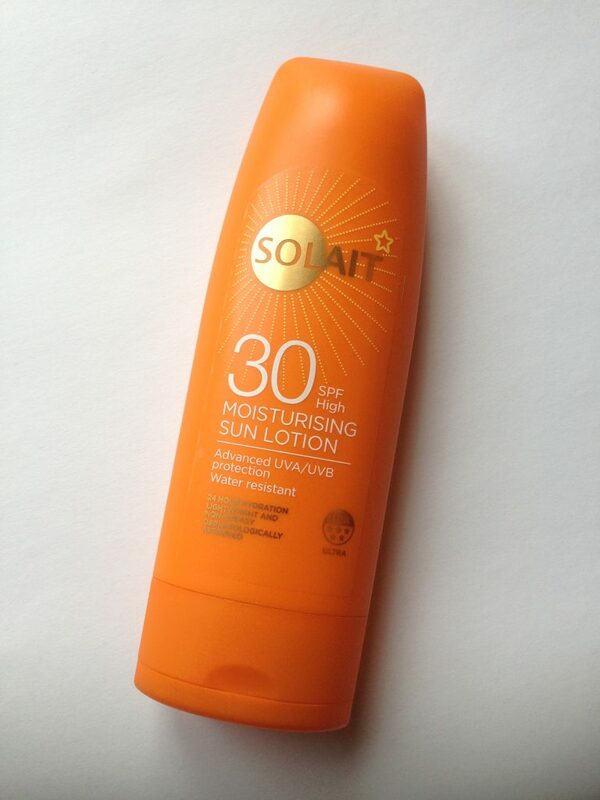 Solait Lotion SPF30 200ml, RRP £4.49. 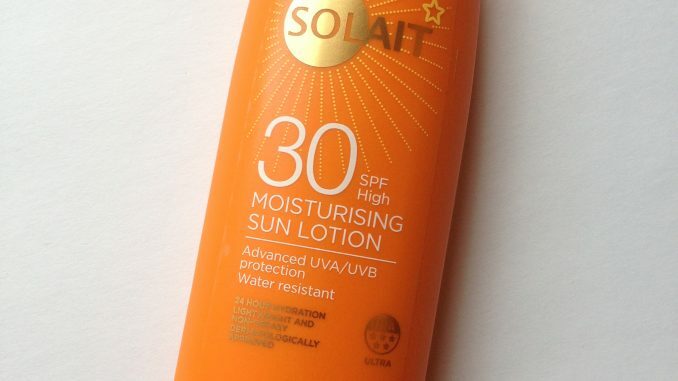 The Solait range is currently on special offer at Superdrug – free beach ball if you buy two products; and all suncare is on buy gone, get the second for half price.